We open to Joker Jr cutting a hole in a wall while talking to someone. It’s not immediately clear who it is, but after a flashback to a week prior it’s revealed to be Jon being held in solitary confinement without access to sunlight in order to dampen his powers. In the meantime, Rex has been busy recruiting new members for the Gang and has “Grundette” beat the crap out of Joker Jr while trying to figure out where the Super Sons are. 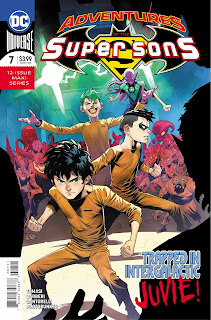 Moving on, it is revealed to us that the prison planet is made up of various districts, the boys had been sent to “Levitztown,” and Robin has been working with Joker Jr to locate Jon. What follows is a genuinely great sequence of Robin doing some classic Batman detective work to find his best friend. Rex has recruited a bunch of these alien juveniles to the Gang and dressed them up as various C and D list villains from earth. They clearly know nothing, but that doesn’t stop Robin from beating up a couple of them and lassoing Kid Riddler (not his real name) to get someone to crack. 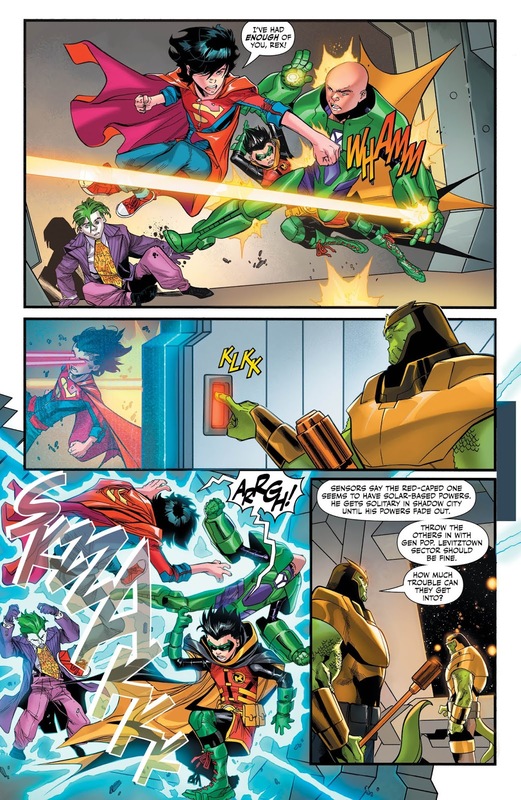 Eventually, one of them, AL-X, who is allegedly a Green Lantern in training (though he looks suspiciously close to an Ultraviolet Lantern) does speak up and sends Robin off to an inventor that Joker Jr went to find a few days before. Robin leaves AL-X in charge (seems likely to backfire) before heading off to find this inventor – who is revealed to be Gizmo! Robin’s inner monologue is really enjoyable here, from displaying his care for Jon, to trying to be like his father, it is all heartfelt. After another beatdown by Damian, Gizmo sends him off again with another clue to finding Jon and Joker Jr. While Damian knows it is likely a trap, he’s following the lead anyways. You get the vibe from his monologue that he’s getting a little desperate to find Jon and get the hell off the planet. 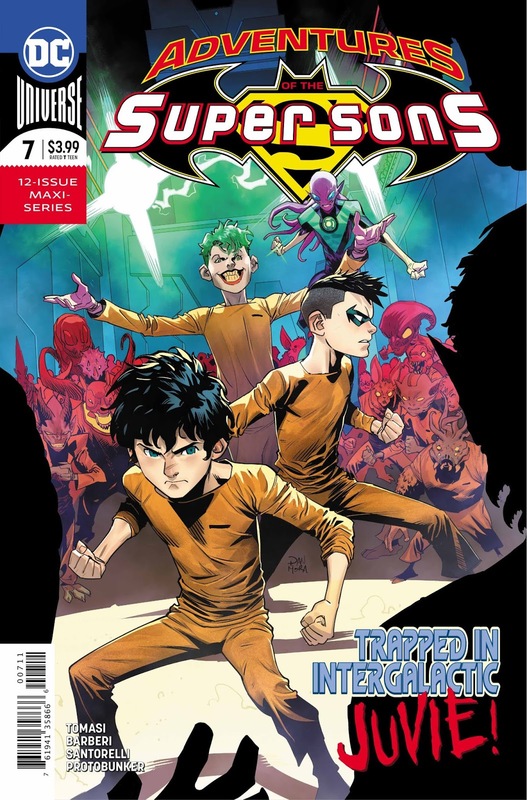 It was indeed a trap, as Rex was using Joker Jr as bait to find Damian and Jon. However, just as Rex and Grundette are about to attack, Jon is able to break out of his cell just in time to save Damian. Their reunion – while brief – is a great encapsulation of their friendship, and is a great cliffhanger leading into the next issue. 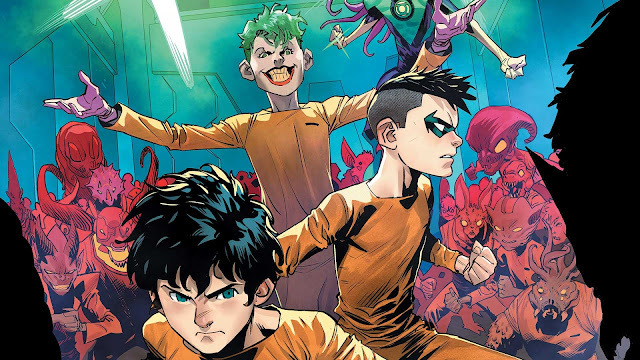 While this issue does have the feel of a wild goose chase, with Robin going from one wannabe villain to the next delivering beatdowns throughout, it is fun. And fun is all that I’ve wanted from this series since it was relaunched in August. Carlo Barberi made his return on art duties for the book and picked up right where he left off. 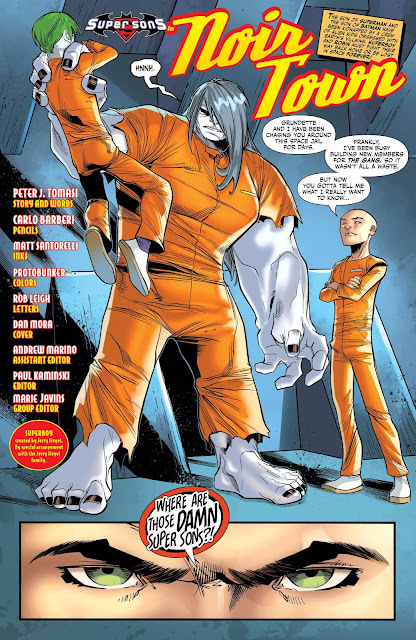 While Tomasi doesn’t answer all the questions I have, this issue does provide us with a nice launching point for the second half of this series.